How much in the tank for Democrats would you have to be as a mainstream media member to say on national television that Hillary Clinton is one of the best Secretaries of State this nation has ever had? Or that Joe Biden is one of the best Vice Presidents? Well that's what liberal radio host Bill Press told Ed Schultz Wednesday on MSNBC's "The Ed Show." BILL PRESS: I think Bob Woodward is an outstanding reporter, but he ought to stick to reporting, Ed. He ought to stick to reporting on wars and leave the inside the beltway political gossip to somebody else. There is zero evidence to support this. I also think it's a dumb idea. 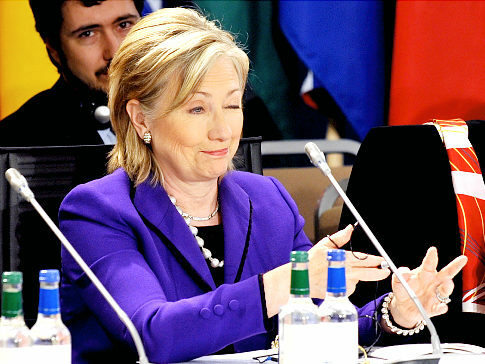 I mean, look, Hillary's an outstanding Secretary of State, I think one of the best we have ever had. Joe Biden's a phenomenal vice president, one of the best we have ever had. There is no way that Barack Obama is going to throw Joe Biden overboard and, and make Hillary Vice President. So Clinton is one of the best Secretaries of State? And exactly what are her accomplishments? To give readers an idea of what past Secretaries have done, the following is an assessment by American Heritage magazine published in December 1981. At the time, David L. Porter, an associate professor at William Penn College in Iowa, had sent a questionnaire to fifty of the country's top historians for their view on who the best Secretaries were and why. 1. John Quincy Adams, who served (1817-25) under President James Monroe, was the first choice of over 80 per cent of the respondents. Stern, cerebral, conscientious, and articulate, he negotiated the acquisition of Florida from Spain in 1819 and collaborated with the President in formulating the Monroe Doctrine. 2. William H. Seward served (1861-69) Presidents Abraham Lincoln and Andrew Johnson. He helped keep France and Britain from recognizing the Confederacy during the Civil War, persuaded France to withdraw her troops from Mexico after that war ended, and successfully engineered the purchase of Alaska from Russia in 1867. 3. Hamilton Fish served (1869-77) President Ulysses S. Grant. Calm, judicious, and untainted by the corruption that permeated the Grant administration, he helped settle the thorny Alabama Claims controversy with Britain in 1871, directed negotiations that settled American claims against Spain, and signed a commercial reciprocity treaty with Hawaii in 1875, helping to pave the way for later annexation. 4. Charles Evans Hughes served (1921-25) Presidents Hording and Coolidge. He presided over the Washington Conference for Limitation of Armament (1921-22) that froze for a decade naval armament among the United States, Britain, and France, and he brought about the 1922 Nine Power Treaty, which called upon its signatories to maintain an Open Door policy toward China and respect her independence. 5. George C. Marshall served (1947-49) President Harry Truman. The first professional soldier ever to become Secretary-and the man who held the post for the shortest time among the top ten-he helped establish the postwar policy of containment. He promulgated the Truman Doctrine that provided military aid for Greece and Turkey, developed the Marshall Plan for rebuilding postwar Europe, and helped foster the Organization of American States and the North Atlantic Treaty Organization. 6. Dean Acheson, Marshall's successor, also served (194953) President Truman. He helped create NATO, brought West Germany into the European defense system, and implemented a policy of armed intervention in Korea. 7. Henry Kissinger, our only foreign-born Secretary of State, served (1973-77) under Presidents Nixon and Ford. After four enormously influential years as Nixon's special adviser on national security affairs, he sought, as Secretary, to relax tensions and promote trade with China and the Soviet Union and pioneered the art of "shuttle diplomacy," traveling 560,000 miles in search of peace. 8. Daniel Webster, one of only two Secretaries of State to hold nonconsecutive terms, served under three Presidents: William Henry Harrison and John Tyler (1841-43) and Millard Fillmore (1850-52). He negotiated the WebsterAshburton Treaty of 1842, averting war with Britain over Maine's boundary, and asserted America's right to recognize republican Hungary and other popular governments in Europe. 9. Thomas Jefferson served (1790-93) President George Washington. As our first Secretary of State he established a host of diplomatic and administrative precedents and, when war broke out between France and Britain in 1793, subsumed his own sympathy for the French Revolution to successfully administer a policy of strict neutrality. 10. John Hay served (1898-1905) Presidents McKinley and Roosevelt. An expansionist, he urged annexation of the Philippines, called for an Open Door policy toward China, helped prevent partition of that country after the Boxer Rebellion, and negotiated the 1903 treaty with Panama granting the Canal Zone to the United States. Pretty impressive, would you say? By comparison, exactly what has Clinton accomplished to even put her on this top ten list? Not surprisingly, Schultz didn't ask Press this seemingly obvious question, for that might have conflicted with MSNBC's pro-Democrat agenda.